FXTAS is a very common tremor/ataxia syndrome, which is newly described (as of 2001). It is a late-onset disorder, typically beginning in the 60's or 70's, with involvement of multiple systems -- gait ataxia, intention tremor, peripheral neuropathy, autonomic dysturbance, and sometimes dementia. FXTAS may affect as many as 1/3000 men over the age of 50. (Hall et al, 2005). About 3% of persons being tested for hereditary cerebellar disorders are positive for FXTAS. Some say it is the most common inherited ataxia, others say Friedreich's ataxia (1/50,000) is the most common (Wallace and Bird, 2018). It seems to us that if you half the frequency to account for women to 1/6000, from these #'s it should still be 10 times more common than Friedreichs. Very few people are tested because there is no treatment. This is similar to the situation with all other inhereted ataxias. According to Wallace and Bird (2018), specific treatments are available for only a few of the hereditary ataxias, including vit-E deficiency, Refsum disease, cerebrotendinous xanthomatosis, and CoQ10. This is not much considering the 100-300 ataxia disorders that these authors discuss as of 2018. FXTAS is an X-linked disorder. There are 55-200 CGG repeat expansions in the FMR1 gene. Full mutations cause the Fragile X syndrome, which is much more severe. Males transmit this gene to all of their daughters. Thus the inheritance pattern of the disease itself goes from father->daughter->male children. Female carriers (the daughters) have a 50% chance of transmitting the gene to each child (male or female). b). 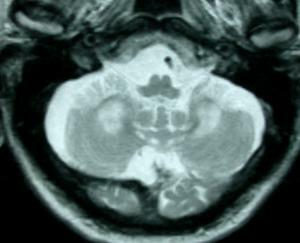 The middle cerebellar peduncle sign on MRI. High signal seen in both middle cerebellar peduncles in person with Fragile X associated tremor ataxia. Practically, very few people pay out of pocket for genetic testing, because there is no direct benefit to them for doing this. Insurance companies also seem to be reluctant to pay for academic activities. There is no treatment, but genetic counseling may be helpful. For example, daughters of a man with FXTAS may benefit from the knowledge that they are a carrier, and that 50% of their male offspring may have FXTAS. Similarly, 50% of their female offspring may be carriers. We expect that in the future, gene editing technology may evolve to the extent that these FXTAS can be treated. Apartis, E., et al. (2012). "FXTAS: new insights and the need for revised diagnostic criteria." Neurology 79(18): 1898-1907. Hall DA and others. Initial diagnoses given to persons with the fragile X associated tremor/ataxia (FXTAS).